The seven guests at a dinner party in the Annex are all in their forties and fifties, busy juggling careers, marriages, and nearly adult children. Conversation that might have revolved around nannies or real estate a few years ago now turns into a lament about aging parents. "I must have spoken to her five times yesterday, about dealing with her bank," a lawyer complains. "Then, first thing this morning, she's on the phone as if the whole thing never happened." "At least she lives in Toronto," says an editor. "I had to fly to Winnipeg every other weekend for a year, trying to deal with my father and calm my mother down. He drove her nuts. He wouldn't take a bath, refused to shave. It was a goddamn relief to get him into a nursing home." "Let me tell you," the hostess calls from the kitchen, "the Big A for me isn't AIDS. It's Alzheimer's, and it scares the hell out of me." So it should. Under the force of Alzheimer's disease, a lifetime of information disappears. Memory, the promised comfort of old age, slips away. Vocabulary fades, like words inscribed in invisible ink. Names of once-loved people vanish. Bathing, eating and dressing turn into terrifying puzzles. Behaviour becomes unpredictable -- aggressive, hostile, even lewd. Patients lose their ability to walk, sit, eat, smile. Death occurs from dehydration, malnutrition, pneumonia, or, a quaint expression, "general wasting." In Ontario, life expectancy is now 75 and rising; the population over 85 will more than double in a decade. The province's Bill 173 on long-term care will shift public resources away from institutions and into services that maintain old people at home. But who will make sure the system works? The government? Fragile old people? Their families? Who will see that mother visits the doctor, gets her glasses fixed, buys new shoes? If the government hires a permanent helper, what happens if they don't get along? Among people over 80, one in five is cognitively impaired, usually with Alzheimer's. Who will be responsible for them? Those who work on these issues believe the burden of care will continue to fall on the family. And that burden may last a long time. Because of earlier diagnosis and better medical care, the average Alzheimer patient will live about fourteen years between diagnosis and death, twice as long as a decade ago. If you ask Dr. Donald Stuss of Baycrest Centre's Rotman Research Institute on memory disorders whether doubling the life expectancy of Alzheimer sufferers is beneficial, either for victims or their families, he seemed embarrassed. "I prefer to keep that opinion personal," he says. For families of those with the disease, the personal is intensely painful. Middle-aged people become the "Sandwich Generation", mostly women (although more men are becoming involved), trapped between still demanding children and failing parents, between domestic responsibilties and the demands of work. Recent American statistics say that about one-quarter of the work force expects to assume elder care responsibilities over the next few years. Nora Spinks, president of Canadian Work & Family Services, an organization that helps employees navigate through the maze of child and elder care services, says "Elder care is an issue that's bigger and broader than child care has been or will ever be." Pressures on the Sandwich Generation will increase as the baby boom moves deeper into middle-age and their parents increasingly need their help. Every day, the Baycrest Centre for Geriatric Care on Bathurst Street provides 2,000 people with a range of services, including meals-on-wheels, independent apartment living, a nursing home with 372-beds, and adult day care. Every Monday, busloads of clients arrive for the start of a week in Day Care. Many in the group wear hearing aids or shuffle along behind their walkers. The routine seldom varies: Morning exercise, arts and crafts, news in Yiddish, movies, and outings twice a week to parks and shopping malls. They have lunch together and an early supper so they can be home before dark. Isaac Grabor is sipping tea at a table in the activities room. He smiles into the distance, gets up and wanders into the lobby. He's tall and physically commanding despite his age, 82, and his bothersome arthritis. He picks up a copy of the Toronto Star and lets it flutter, unread, onto an arborite table. His social worker, Fran Kleiner, introduces us. She shouts to overcome his considerable deafness. Would he like to be interviewed about his time in Day Care? "Sure," he answers. "Why not?" He reaches into his hip pocket and pulls out a candy wrapped in shiny paper. He smiles as he hands it to Fran, as if she were a child and he still a grown-up with something to offer. We sit in a private office and I start the tape recorder. I had been warned that difficult questions might upset him. "How long have you been coming to Day Care?" Isaac smiles and looks uncomfortable. "Almost a year?" I suggest. He watches the tape turning in the machine and nods. Subtle changes are occurring in his brain. Neurofibrillary tangles are forming within the nerve cells of his cortex. Neuritic plaques are building on degenerating nerve terminals. Nerve cells are shrinking. His brain is growing smaller. Last week, a neurologist confirmed Isaac's diagnosis: Alzheimer's disease, "moderately advanced". I try again. A simpler question. "Do you like coming to Day Care?" "Yes," he replies quietly, in thickly accented English. "There are other people here." Then he loops the conversation back to his boyhood in Hungary, the birth of his two daughters, his emigration to Canada, the shoe business he ran until his wife died sixteen years ago. He stops, reaches inside his breast pocket, pulls out a form letter from the Ontario government. It thanks him for helping with a 1980 seminar on small business. The paper is wearing thin, the folds beginning to tear. Three times in our fifteen minutes together, he hands it to me, with pride, refolds it, and tucks it safely back inside his jacket. A few years ago, when Isaac was still living on his own, his family began to notice changes in his behaviour. He'd become agitated when mail was delivered, demanding that one of his daughters leave work to help him sort it out. One night he called his daughter Connie to say he couldn't get the house lights to work. She and her husband raced over and found that he'd forgotten how to work the switches. When Fran first met him at Day Care in June, 1993, there was no talk of Alzheimer's. "He was hard of hearing but he was aware of what was happening, took pride in what he had accomplished in his life." He complained about memory problems and being depressed. After he was put on antidepressants, some of the confusion disappeared. That often happens. He continued to live at home. A grandson moved in for a while. He went to Florida for a few months, as usual. When he returned, on his own again, Fran began noticing changes. He seemed more confused. Laura, his older daughter, took him for a routine physical. When it was over, the doctor handed her a note. On it, he had written one word: "Alzheimer's". "I admit I was stunned," Laura says. "I remember dropping my dad back at Day Care and driving to my husband's office and being very upset." For people in her position, denial is natural. Recognizing a parent's confusion as something more serious than normal aging upsets forever the balance of responsibility. Most children refuse to act until there's a crisis. "He'd just come back from Florida," Connie says. "It was a terribly cold day. He'd left his house, I don't know what for, and when he came back he couldn't unlock the door. He had the key but couldn't make it work. He walked several blocks to my cousin's house, and when he got there he was almost frozen." Connie and Laura have decided that, for now at least, their father will live with each of them in turn. They can manage for a few months. Things might improve, they tell themselves, half believing it. They meet with Fran at Baycrest. "He seems obsessed with transportation," Connie says. "When my husband, Syd has to drive him somewhere, he keeps asking, 'Has Syd gone yet?' It doesn't matter that he sees Syd right there. The other night at about 10:30 we found him all dressed to go out, on the telephone calling Wheel Trans to pick him up." Fran tries to explain that when most of us look at a clock, we automatically sort through an array of other cues. We look outside. We see whether it's sunny or dark. "Isaac doesn't notice these things any more. He's focused on one thing -- getting to Day Care." Connie, slightly embarrassed, complains that during the three weeks her father was in her house, he refused to take a bath. "It was hot. His clothes were smelly. He put the same thing on every day." Finally her husband laid down the law, said he wouldn't take Isaac to synagogue unless he cleaned himself up. "Did it work?" Fran asks. "Yes. As Syd says, 'We're not really dealing with an adult.' "
As a social worker, Fran must defend her client and console his family at the same time. She wants them to know that Isaac isn't being intentionally difficult, and that, despite appearances, he's not a child. "He's an adult, with a lifetime of experience. What's happening to him is frightening. That letter he shows to everyone in Day Care? It makes him feel a little bit like the person he used to be. We have to try to help him maintain his dignity." Meanwhile, Fran wants his daughters to sort out their own needs. They're in their late forties, and they have husbands and children and jobs to consider. They discuss practical issues like bathing and transportation, balancing their father's demands and the compromises they're willing to make. Calmly, Fran talks about establishing a "comfort zone." When we are alone, I ask Fran why Laura and Connie seem so reluctant to face the fact that they are not dealing with problems they can solve but with a progressive, fatal disease? "They're feeling somewhat overwhelmed," Fran says. "What's most important to them is how they'll get through the day. Future planning will come later." Connie and Syd live in a meticulous house in a Toronto suburb. To the right, inside the front door, there's a table covered with gilt-framed family photographs, the most recent taken at the wedding of their oldest son. Isaac is there, smiling. "It's a shame, really," Connie tells me. "He kept saying how much he looked forward to the kids getting married, but by ten o'clock all he wanted was to go home. I'm not sure he knew why he was there." We move into the family room. "I don't know if you believe in astrology, but my father and I have the same birthday. Our personalities are similar. My sister and I are close, but very different. I've always been the emotional one. But I think we agree about my father's care." At first, though, Laura thought Connie wasn't allowing their father to be an adult. "That's because I saw more of him," Connie says. "He always came here on weekends to go to synagogue. It wasn't that my sister didn't want him. It was just more convenient." When Connie tells her father it's time to live with Laura for a while, he asks, "How come I'm being punished?" Connie tells him he's lucky that he has two places to go, that his grandchildren love him, Syd loves him. "He doesn't seem to appreciate it. He's not really acting like my father anymore." Laura's home, in another part of town, is older, more weathered. Jackets from several seasons crowd the hooks near the back door. While their nineteen-year-old son is at camp, Isaac stays in his bedroom, surrounded by sports posters and empty liquor bottles. Hanging on the chair beside the bed are the plastic bags and twist ties he uses for a suitcase -- socks, shirts, underwear, bagged separately. On the nightstand beside the bed is a stack of napkins carefully cut into small squares. Every day he brings them home from Day Care, takes out a pair of scissors and turns them into "Kleenex". He stuffs his pockets with unused sugar packets and artificial sweetener that he unloads in the kitchen. "Connie says that I'm the one who doesn't accept the situation, but I think she's the one who doesn't. She's more high-strung than I am, a bit of a perfectionist. I'm more laid back." I ask her what frightens her most about her father's illness. "I worry that he might get lost." A week later, Laura phones me. "Remember you asked me what I feared most where my dad was concerned? Well, it happened. I was going to take him to the mall near us. When I woke up the house was very quiet and I couldn't find him. I looked outside and there he was, standing on the sidewalk. Apparently he'd set out on his own and turned the wrong way. Fortunately, he was able to find his way back." Fran Kleiner explains that although Laura and Connie both respect their father's wishes, they disagree on his abilities. "That's very typical. Often the one that feels the parent is more capable is the sibling who doesn't have as much to do with that parent. The sibling most closely involved is the one who sees the difficulties most acutely. Some children find it impossible to become involved at all, to see their parent deteriorate. It's not that they care less, it's just too painful." Connie refuses to believe her father has Alzheimer's, despite the diagnosis. "I have a picture of someone with Alzheimer's and that's not my father. Maybe it's just denial. My cousin, a psychiatrist, explained dementia to me and a lot of the things about my father are very much a part of it -- the rigidness, the isolation. We can't really have a conversation any more because of his hearing. He's stopped reading. He can't even watch TV. I'm afraid nothing gives him pleasure." Alzheimer's disease bears the name of Alois Alzheimer, a German psychiatrist and neuropathologist. In 1906, his autopsy on the brain of a fifty-one-year-old woman who died of severe dementia revealed certain anomalies. Today this post-mortem evidence remains the only conclusive proof of the disease, but tests can be done on the living and they are generally accurate. Dr. Morris Freedman, a behavioral neurologist, is the director of a cognitive assessment program at Baycrest. Because early Alzheimer's is difficult to diagnose, many patients are referred to him by other doctors to have their opinions confirmed. As part of the evaluation, Dr. Freedman and his associates administer an intensive mental-status examination. Patients are asked to repeat numbers, draw shapes, to recall the year, name the prime minister, say whether a hammer can cut wood. There's a math challenge some of us would find taxing: count backwards from 100 by sevens. Additional tests rule out disorders such as tumours or strokes. Passing on the diagnosis is part of Dr. Freedman's job. But whom should he tell? Patients, their families, or both? For Dr. Freedman every case is different. "What I do in all cases is tell them there's some memory problem, that I'm doing some tests. Then I wait to see if the patient has any questions. If the patient has no insight, they say, 'Thank you very much doctor,' and then they ask me about their feet. Or their dentist. It didn't sink in. They don't have enough cognitive ability. Then I leave it at that." In most cases, it's the families who want to know what to expect and what help is available. Isaac's own doctor has suggested that, for the time being, he could return to his own home, with 24-hour-a-day supervision. Laura and Connie agonize over what to do. They tell Fran that he seems to have settled into living with them, that if they send him back to his own house he'll think it's because they don't want him anymore. "Look," Fran interrupts. "I met with your dad separately and he told me, very clearly, that he would prefer to go back to his own home. He'll adjust. He adjusted to living with you." Laura and Connie aren't convinced. "It seems to me," Fran continues, "that you have three alternatives. He can stay in one of your homes. He can stay in his own house, with help. Or you could think about an institution." This is the first time an institution has been mentioned. The word resonates in the silence. Laura and Connie stare straight ahead, rigid in their seats, peering down a long tunnel they have chosen, until now, to ignore. Fran tries to reassure Laura and Connie. "You would not be terrible daughters if your father didn't live with you. But from what I hear, my guess is that you would prefer to have someone live with your dad in his house." Neither sister comments, but both look mildly relieved. She tells them how to assess their father's needs so they can find the right person to look after him. "I must tell you," Fran concludes, "it's my bias too, to keep a person in the community as long as possible." That's also the bias of the Ontario government's new legislation on long-term care. At the moment there's a string of agencies -- some public, others volunteer -- who promise the elderly, and other dependent groups, everything from friendly visitors to live-in homemakers. Finding the right care can be frustrating, especially when the search usually follows a crisis and everyone's desperate for an immediate solution. All this is supposed to improve when the government's "multi-service agencies," or "one-stop-shopping" are established. But even if multi-service agencies overcome bureaucratic inefficiencies, in-home services simply cannot meet the extraordinary demands of those with Alzheimer's disease or their families. 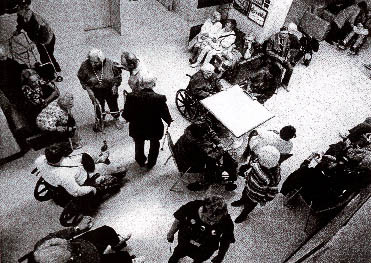 According to Moshe Greengarten who deals with government on behalf of the Baycrest Centre for Geriatric Care, "A lot of people in government have the idea that institutions are only warehouses. I'm afraid this might become a self-fulfilling prophesy. By limiting our funding, we'll have fewer beds, patients will be admitted too late, programs will suffer -- and we will become little better than a warehouse." It's possible that we are about to repeat the disasters that followed the closing of mental hospitals in the 1970s, when heavily medicated sick people were shovelled out into the world of subway grates and Donut shops. Dr. Michael Gordon, vice-president of medical services at Baycrest and chair of the Ontario Medical Association's advisory committee on long-term care, supports the legislation for most groups. But he worries that the new legislation mistakenly assumes that people with conditions such as Alzheimer's want to stay in their own homes and that community care is both more humane and less expensive than institutional care. He believes a homebound person can be socially and emotionally imprisoned. "Independence does not always mean living alone. The result may be the 'right to rot' -- benign neglect and paternalism in the guise of a of high-minded goal to give care to frail and elderly people." In Ontario only six percent of the elderly population lives in an institutional setting. No one knows what percentage of people should, ideally, be institutionalized, but if the rate is lowered to five percent, as it is in Britain, the system will need 18,000 new beds over the next 20 years. Caregiver "burnout" -- the physical and emotional exhaustion that comes from being a parent to your parent or spouse -- takes a frightful toll. Some of the most devoted families eventually buckle under the incessant demands of Alzheimer's disease -- the ranting, the sleeplessness, the incontinence. Permanent institutional care becomes the only realistic solution. The Jewish Home for the Aged, part of the Baycrest Centre, was built primarily for people in their seventies who needed three square meals a day and a little help bathing. Today, most of the residents are much older and up to 90 percent have cognitive impairments, including Alzheimer's. I visit one of the floors dedicated to these residents. The elevator door opens in front of half a dozen women who sit on brightly coloured naughahide chairs watching others come and go. Those who frequently wander off wear wristbands, a warning to staff and visitors that, for their own safety, they must not leave the floor alone. As I step out of the elevator, a woman in a floral blouse grabs me and asks if we can talk. "Sure," I answer. She squeezes my hand and says, "I used to be a light bulb, but now I'm out. It's hard to pick up on the next stuff, it's too near." Then she points to the woman beside her dressed in green and giggles. "She looks like a salad." Down the hall, in a wheelchair, a beautifully coiffed woman sits weeping. "I don't want to go into the dining room. I don't want to." Another patient tries to console her. The halls are full of activity. The residents, like many Toronto pre-schoolers, are lovingly attended by dark-skinned women with lilting voices. Some watch television, paint pictures, and make a stab at eating. Others who cower in their rooms seem beyond comfort. When a bed becomes available, they will be transferred to another floor, or into hospital. Chester Village on Broadview Avenue practises a different method of treatment, adopting an American model that breaks the standard formula of medication and children's games. Patients who couldn't speak when they were admitted have learned to express themselves through work, performing jobs we normally do in our own homes -- making beds, vacuuming, even cleaning toilets. Under supervision, they prepare sandwiches for their own lunches, and during the school year, for a local school. "Sure, it looks like routine factory work," says Christine Hill, coordinator of support services with the Alzheimer Society of Metropolitan Toronto. "But when you've cared for someone with Alzheimer's, you understand that routine is very important. Family members are coming to accept that this sort of work is not demeaning but actually adds meaning to patients' lives." Connie understands that to her father's generation, being sent to a "home," even a good one, was a great shandeh, or shame. "It's like you're sending them off to die. But if it comes to the point when he's not aware of who we are, then we would put him in a home." "If we decide to fill out an application form," Laura says, "I think my father should be consulted." How much control can people with Alzheimer's disease exercise in their own care? In the early stages, quite a lot. Money matters are often the first to be taken over by others. "My friend's mother," says Connie, "became incapacitated for years and they couldn't get access to any of her money. So before my dad went to Florida we talked him into signing over power of attorney. Now my sister looks after all the banking." Living wills, completed when a person is still competent, are a new form of self-control. They instruct doctors on how that patient wants to be treated in a medical crisis. I ask Connie if she's ever discussed a living will with her father. "Unfortunately, I think we've left that too late. We certainly couldn't talk to him about the future now; he's already losing the past." Her eyes cloud over. "There's this suitcase of old pictures. We were always going to get him to go through it and tell us who everyone was. We kept putting it off. Now my father doesn't remember the people in that suitcase." Laura recalls her father talking only once about his own mortality. It had to do with instructions following his death, not before. "Out of the blue he said to me, 'When I die, I want you to hire someone to say Kaddish [the mourner's prayer] for me.'" Like many of us, Isaac has written a will distributing his estate; he's said nothing about his final years, or how he would like to die. Laura says she's never thought seriously about her own aging but now she's afraid she's becoming like her father. "It really worries me, this loss of memory. I keep a notebook at my desk to write down phone conversations. If it ever got to the point where I realized there was a good possibility I'd be like my father, I'd leave instructions about what I'd want to done. I guess I should do it beforehand, shouldn't I?" Christine Hill is often asked a painful question: What are my chances of getting Alzheimer's? "If someone has a parent who's really suffering, they want to know their own future, to make plans while they can." For Dr. Donald Stuss of the Rotman Research Institute, predicting Alzheimer's disease is also a major concern. "So many people say, 'I think I have Alzheimer's because I have a memory problem.' If I give a talk to an audience of middle-aged people and ask 'Does anybody here have a memory problem?' about 95 percent raise their hand." He rhymes off some of the known causes of temporary memory loss: tension, overwork, lack of sleep, drugs, alcohol. He thinks that "the only way to crack this thing" is to take a much broader approach, testing people periodically, starting when they're 40 or 50 and following them through life to see who ends up having Alzheimer's disease or some other memory disorder. "If we did this for 40 or 50 years, people would die and we'd be able to study what had happened to their brains. Then, along with studying behaviour, genetics, neurology, and psychiatry, we could get a real handle on the problem." "But right now," I ask, "could you take a blood sample from me and tell me if my genetic markers indicate I'll develop Alzheimer's?" The answer is complicated: Yes, there are genetic markers that seem to indicate a predisposition to Alzheimer's. But no, we don't know if they require another factor to trigger the disease, or what that factor might be. Will we ever be able to predict who has a better-then-average chance of developing Alzheimer's? "Probably," says Dr. Stuss. "We can do it in the case of Huntington's. With Alzheimer's, we're not there yet." The ultimate search, of course, is for a cure. There have been impressive advances in genetics and the pathology of behavioural disorders, but in the short term, during the lifetime of those with Alzheimer's, a cure is unlikely. This raises legitimate ethical questions about extending the lives of those in the final stages of Alzheimer's disease. Why give these patients antibiotics when they develop pneumonia? Why insert feeding tubes down their throats if they can't eat? Anyone can put in place a living will that legally prevents doctors from prolonging life after it has lost its meaning. But not many do. How many of us, when active and alert, can imagine having a disease like Alzheimer's? "It's not something most of us think about," says Christine Hill. "I guess it's only a select few, those who are forward thinking." The host at the Annex party looks around the dinner table and asks, "How many of you have a living will?" "I've got one. Prepared by the Centre for Bioethics at the University of Toronto. It's been sitting on my desk for about six months." "Me too. Isn't it depressing? I gave one to my mother but there's no way she'll fill it out. She's seventy-five and still has her marbles, but she won't even look at it." "It's too late for my father. I don't think he'd even understand what a 'will' means!" Large signs wishing everyone L'Shana Tova, or Happy New Year, decorate the walls at Baycrest. Isaac's Day Care will be closed for the Jewish holiday of Rosh Hashanah. In the dining room, tables are covered with white cloths and one of the staff is explaining the meaning of the braided Challah [it represents God's crown], and the apples dipped in honey they're passing around. "You should have a sweet year. You should be gezunt [healthy] and we should all be together next year." From the far side of the room a woman shouts, "And no tzures!" ["No trouble!"] Everyone stands and leaves to board the buses at the front door. Isaac gathers leftover slices of sticky apple, wraps them in a napkin, and tucks them in his pocket. He smiles and sets off to join the others.